In 2004, when I was going to Badrinath shrine I remember in the bus, I was very seriously involved in having a conversation with Shri Mahavatar Babaji mentally. I was sitting near the window and was quietly envisioning a picture. While descending and ascending on the steep mountain curves I was thinking as if he was with me and speaking to me about many important things. I was in great search of him you see. I was serious and steady in my pursuit of meeting him personally so that he could teach me face to face as is the normal method of learning between the Master and the disciple; that is what I understood at least in the beginning. I had read a few books around this time which had little information about him and I very naively set out to Badrinath shrine expecting him to find him easily and assuredly. I was introduced to scarce information about him nonetheless, I saw that there was a great pull between us- I was extremely attracted to him. Although I knew very little about him, still I was crazy about receiving spiritual enlightenment from him directly. I trusted him blindly and wished that he should accept me as his disciple when I meet him there. This was one of my purposes of seeing him personally in Badrinath. I had till then not even met somebody who was clamouring for him like me and hence had no opportunity to share my alike feelings with them. I was a lone voyager in every respect . My hidden feelings had sometimes suffocated me. He was anyway speaking to me by this time throughout guiding me to go to inner chambers where the soul rests and responds, a condition to which we are never introduced and acquainted with by our previous Gurus. Shri Mahavatar Babaji was obviously different. I was already under his tutelage learning through a new, highly evolved method of learning but was unaware about the developments. In fact, I did not even know that I was by this time being equipped to learn in the most developed and advanced method of learning- through telepathy. I thought about it and responded instantly after splitting his ideas or boons into two parts, “I am not too sure if I am inclined to write books. It will merely boost my ego and will be a cause to show off to the world, it is pointless I think. However, if you can give me some good spiritual experiences for which I am desperately craving, it should be fine because that is what I am looking for. My books if I write supposedly, in time to come will be replaced by some other person’s; this world is constantly changing so the ego cannot be satisfied for too long. All worldly pursuits and happiness is anyway short-lived and hence I am more interested in taking liberating knowledge from you irrespective of anything. And if you still say that I must write books, I am totally clueless. What can I write, I am a fledgling. In any case, I would like to first get all experiences, then write with my experiences and only after understanding everything fully.” He accepted my point of view. I began blogging from May 2008 and there has been no discontinuation. Ever since then, after getting enough spiritual and physical world experiences, everything that has been written has been out of my own understanding and beliefs. My posts have been delivered only after I have had some mystifying experience and not merely from a scholar’s point of view. It is because I had a great desire to be enlightened now and here and that desire prepared me for anything and everything. And my desire was too strong to be ignored. From then till now, all my sadhana and learning has been based on this incentive and inducement. Since the time of this milestone, almost every year I have been called to the Himalayas to meet him, but he does not meet me. When I go home, I am given harder lessons in the hope that I must be ready for him to meet in future, maybe next year, then pushed to next year. It has been more than ten years since this peculiar thing has been happening. The height was when we almost died in a treacherous trek in Satopanth area when we were made to believe that I will be able to see him. But contrarily we were told that we were sent there to either wear off some of our karmas or on my part, I was tested to the maximum. And we returned home with those experiences without meeting him.Whatever it is, I still believe in him, in Shri Mahavatar Babaji and his divine words because he would not be punishing me or harassing me. Rather, he is making me what he thinks I can be in spiritual stature. Had it not been for him, I would not have undergone so many adventures, misadventures, beautiful experiences, extraordinary perceptions and great meditations and so on. I still believe in him and have my trust placed in him wholly. All my tapasya has been revolved around him since the time I found him. In the past two years because of excessive work and all kinds of spiritual activities undertaken by me voluntarily, my body showed signs of excessive fatigue and I was also in constant pain. After my daughter’s marriage in November 2013, I was pondering and had decided to slow down consciously. My mind was showing signs of tenderness and helplessness because of affected health. I was about to lose interest in meeting new great and defying challenges. I was wondering if I should go further and extrapolate. Haven’t I done enough by now already, I asked myself several times? I think I did enough to be proud of myself because if I looked back, I realized I did extrapolate after all and I could now let things just be. I wanted to stop applying my mind force to make mountains move now……..! It was this point that Babaji was waiting for and wished to intervene with full force and interest. He did exactly that. He again began to call me to the Himalayas and put life force in me with this idea. I told him that it has been many years since I have been wanting to have his darshan and by now my body has begun to deteriorate and I would like to have him inside rather than outside at this stage. I also reminded him that I am now ten years plus and am aging so I should not expect that kind of vitality from my body while he is ageless and immortal. Because of my immobility, there was weight gain and more problems seem to be coming my way and therefore I should slow down. Between the months December 2013 and February 2014, I was advised to take certain foods and medicines and I began to improve. I was sent to yoga classes and the joints became suppler and I could bend and have better body movements. In February end, I was communicated that I should not stop travelling and should go to Varanasi in March and then to Binsar in May. I was still skeptical and doubtful of things to come. So I took one thing at a time. I made it to Varanasi and was waiting for May to come and then take my call. I trusted him because I could see a pattern, a specific pattern that he has implemented to groom, teach and enlighten me. He was following that with all earnestness. So I thought that even if one more time he repeats the same exercise of deluding me and making me believe that it is time for me to see him personally and then decline me, it will be worth it. I have nothing to lose anyway and God is seeing that I am always sincere in my invocations and endeavour. What if he does meet me? How can I lose that opportunity? And what are his exact future plans? Before I went to the mountains again, I was told by a group of saints including Agastya Maharishi on 16th May afternoon in my powerful meditation in Delhi that this time Shri Mahavatar Babaji has called me to Almora district for sure to have his darshan. My excitement and faith revived suddenly. But sometimes I felt otherwise. I told them that I am skeptical because this could be one of his invented ways to drive me crazy again and I am very low in my will power by now because of lukewarm health and many denials that have come with each trip. I even told them that it is by now very predictable, the whole game is predictable. Moreover, moving with so many luggage, some mine and some for him in the mountains is awesome. So why not avoid a story whose ending I already know? Very interestingly my own mother who is no more, came to me at least three times sometime in the day in beginning and middle of May to say that Babaji will surely meet me one day. Now this was very assuring and believable because she was not in their league or confederation at all to conspire or delude me like them! So I began my new journey again. And this time I was not given a driver. I and my daughter with a brand new assignment borrowed a car and drove towards Himalayas on a twelve hour journey, at 5.15 am on 18th May 2014. We took turns in driving. I was very shaky in mind and body and questioned if I could drive so much with my erratic and capricious knees. Finally, with full faith and surrender to my Holy Guru Shri Mahavatar Babaji I set out in the open sea of unknown to swim again! The journey was very smooth and the knees behaved as if they have connived with the confederation of the saints and I could drive effortlessly. We reached safely and the place and weather was just right for us. After reaching there, I had no plans or clues about what next after this point. I was purposely not told. So I was at dead end again. But I went there with this mind that the unknown shall be explored and whatever they have willed, which will be unfolded at a time of their consent will be in abidance with full faith by me. With this agreement, we began our next day on 19th May. I was called at two appointed places one by one on two different days saying that they were the meeting venues. First was crowded Bageshwar on 20th May, where there was a Shiva temple called Baghnath, 25 kms from Binsar. And another one was world heritage Shiva temple called Baidyanath, further 25 kms in the pine trees laden, lonely mountains from Bageshwar. I was now driving very confidently in the high and curvy mountains casually like the taxi drivers were doing there with no fear at all or pain in the leg joints. However, nobody came and I was again disappointed! 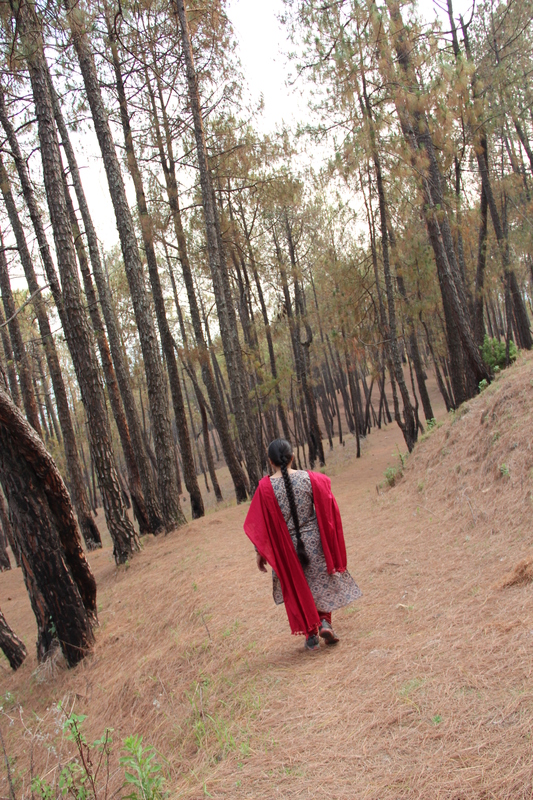 Second place of alleged or purported meeting was the gate of a secluded wildlife sanctuary in Binsar. We drove there on 21st May evening and except for the mountains, the birds and the pine trees, we were met with nobody. So as a first reaction as my submission I told God, whatever had to be done by me has been carried out and I am having no complaints. Maybe I am not ready for it yet. May be I do not have uncountable good deeds until now. Therefore, your wish is my wish and I will now go back home knowing well that whatever my Master does has to be in collusion with God and God had chalked out this plan for me with a perfect design. Whether Babaji meets me in physical form or not, in Spirit he is and will be with me. If he feels that I should be meted out this treatment, I am happy with it because the lessons that he is yet to impart me after calling me so far have not come yet. They are far more important than my eyes seeing him in physical body. Pondering this I became more peaceful and quieter than previous very anxious days. My retreat was so very peaceful and quiet and I enjoyed every moment in nature. And Shri Mahavatar Babaji spoke to me in the my meditation at 4.15 in the morning of 21st May 2014, the day before I was about to leave. “I am what I am today because of my Ichcha Shakti. I became immortal because of my great will power to do unprecedented penance. I have risen to never before spiritual heights only because of my will power. This power is inherent in all of us. You too have extraordinary will power but you were about to become weak in recent months. So I planned and designed this trip to break that incoming weakness. Treat this trip as a pilgrimage. I sent you to Bageshwar and Baidyanath for your daughter’s rising and as these temples are very ancient, I wished that you both should derive blessings from those ancient places. Bageshwar’s Shiva temple has the boon of eroding very hard, past stubborn tendencies while Baidyanath can grant boons to restore chronic ill health. It is a different matter that people don’t know about it. You shall improve your health from now onward and will also be able to work more as you have done in the past. Unbalance in health was weakening your will power. You have covered unimaginable spiritual tracks so far only because you had a great will power. I have used that Ichcha Shakti to make you do maximum tapasya. What the saints have said is not a myth. You will meet me for sure but please wait for some more time. If you discontinue and give up your power to will, how can you meet me? I am making it more and more stronger. I will meet you as many times as I have called you and not met you. I will compensate for all the hardships and declines that I have purposely meted out to you. I will meet you in Badrinath and other places also in time to come. I will call you and after you meet me, you should document those meetings. In the end, there will be two books on Atma and Brahma which I will make you write in Badrinath after some years which will bring you in spot light for right reasons. I have precisely carried out those exercises which will enhance your Ichcha Shakti more and more. I wanted to make sure that your power of will does not fickle out and therefore gave you very challenging things to do. I am about to give you some more hard duties to perform in future soon so that your mind becomes more stronger and you can always bounce back to God Consciousness and perform your spiritual duties because of your strong power of will. Dear friends, some more things were told all of which cannot be told in public. I am yet to really recall all those wonderful things that were imparted to me in May days. Since I have returned home, I have been assigned new absolutely divergent duties which have kept me thoroughly preoccupied. I am practicing earnestly to apply my will power to return with force to my divine consciousness immediately as they finish. The balancing act is on. All this is my tapasya and it really gets harder as you go up……but nonetheless should be pursued! At the very deepest level of your soul, there is resonance. The vibration, if at all anyone can hear, there is a sound vibration of the name Babaji. Babaji, Babaji, Babaji…… it resonates. It is purely very thin, very faint; extremely numb sound vibration of the sound of the name Babaji. This is only possible when at the deepest level of the mind, there is no desire of any worldly things or possibilities of craving for material items, none. Even the fear of life and death is over. You have been thinking of being in presence with Babaji so much that your deepest imagery has him etched inside and you have taken his name so many times silently in your musings since the time you started that it has erased all names, sounds or images or descriptions. Your desire to have his darshan, being in his holy company and serving him has brought you this high state of mind. It has wiped out all delusion or aberrations called Maya. There is no deviation or misunderstanding of any sort. Conclusion-To develop the power of will or Ichcha Shakti, we will be given more challenges, obstacles, snags, troubles, hardships, encounters and stumbling blocks by God. The more our desire to stay one with God and our holiest Guru, the more hard we will have to try to overcome those problems and stumbling blocks to revert to them. So grow and develop the will power with every day and after overcoming them, aspire higher. It is only our will power that will be backing us up in our higher and still higher Spiritual progress. Om sound is the only sound in this Universe that does not require any conduit or channel to travel. Sound, electrical and other waves need a medium. Our spinal chord is a channel and is hollow and like a pipe. Om transfers, moves inside it in the empty hole and it travels on its own. It travels without any channel or nerves in ether inside the spinal chord and in other parts of the body. You are currently browsing the Spirit in life blog archives for the day Tuesday, June 3rd, 2014.